they will still be there tomorrow. Exit by the rear fire escape. cruising Rimmel London and Barry M.
haloed with red exclamation marks. The situations are recognisable, written without judgemental comment and the poems report the shortcomings of petty bureaucracy without ranting or taking sides. 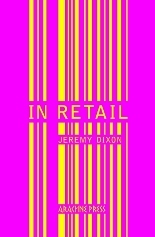 In Retail offers insights and knows how to end a story precisely on the punchline. Each page has the title In Retail in grey reversed print at the top. Each even page has the message ‘Thank you for your custom’ in grey reversed print. Each odd page has a different message, e.g. ‘All made in China’, ‘Obey the till’, ‘Hurry they won’t last long’ in grey reversed print. This layout suggests a receipt roll and the poems appear to be printed on the back, a subversively humorous reflection of how they were composed. London Grip Poetry Review – Jane Lovell	East End Suffragettes: the photographs of Norah Smyth. By Jane McChrystal.